Greetings, readers. 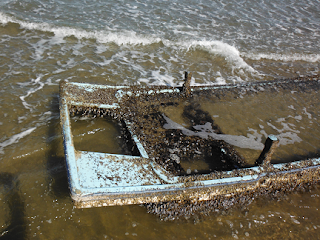 As you can tell, the amount of debris washing up in past weeks has been very low. 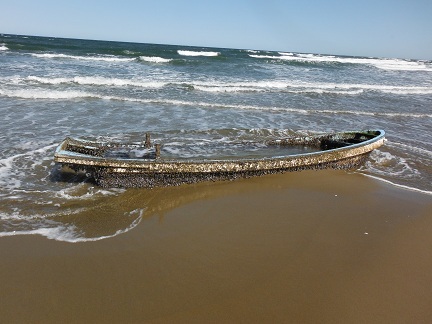 The last major piece of debris reported was the boat that washed up in Long Beach, Washington- complete with live fish. 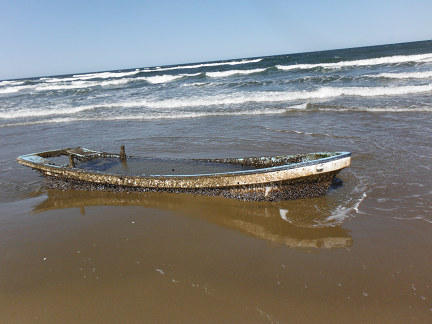 However, earlier this week, a vessel that appeared to be an artifact of the 2011 tsunamis was found in Oregon by a fellow biologist and colleague, Jeremiah Psiropoulos. Jeremiah encountered the vessel while working in a particularly important wildlife area- a critical habitat area for western snowy plover. Western snowy plover (Charadrius alexandrinus nivosus) are particularly cute little sea birds that have been listed as 'threatened' under the Endangered Species Act (ESA) since 1993. Oregon's sandy shores and coastal dunes are essential nesting and breeding grounds for this bird. In order to minimize impact of tourists, media, and other visitors in the area, the boat was immediately removed. I interviewed Jeremiah about his find, which I will share with you below. My questions are in italics, and Jeremiah's answers are in plain text. Thanks for taking the time to let me interview you! My understanding is that on April 22nd, you found a vessel that appeared to be from the 2011 tsunamis on a beach in Oregon. I would like to ask you a few questions about your recent find, how you responded, and your feelings regarding ethical responsibility or environmental stewardship when it comes to exciting beach finds like this one. First, tell me a little about yourself. What is your background and current occupation? My name is Jeremiah Psiropoulos. I am a native Oregonian who grew up in the Umpqua valley. I have always been very fond of Oregon’s biodiversity and specifically its fish and wildlife. I have degrees from the University of Oregon in Environmental Studies and Oregon State University in Fisheries and Wildlife Sciences. I am currently working for the USDA APHIS (Animal and Plant Health Inspection Service - http://www.aphis.usda.gov/) Wildlife Services as a wildlife specialist monitoring and controlling predators that depredate ESA-listed (Endangered Species Act) western snowy plovers (Charadrius alexandrinus nivosus) during the breeding and nesting season. Please tell me a bit about when, where and how you found the boat. How did you happen to be in that area? I am responsible for monitoring two nesting areas that are used by the snowy plovers known as habitat restoration areas (HRA’s). Both are in the Coos Bay, OR area, the first being Coos Bay North Spit and the second is the Tenmile Creek. Around 10 am on April 22nd, I was traveling south along the beach near the jetty on the north spit and found a boat on the edge of the rack line on a receding high tide. The area where I found the boat was within the snowy plover closure area which limits traffic to foot and horse only on wet sand. Due to these restrictions it receives very little traffic and had yet to have any public pass by that morning. Can you describe the boat in detail- any writing, size, condition of the boat, etc. The boat was approximately 20 feet long with an open bow. It had gently sloping gunwales with a live well in the bow and an open area in the stern, presumably for a motor. It was blue color with a red keel that was only apparent after scraping gooseneck barnacles from the hull. I could not find any writing or other marking that indicated its origin. The boat was pretty battered and full of water. It appeared that there was at one time some sort of bimini top attached to the gunwales. Did any thoughts immediately come to mind when you came up the vessel? My first thought was that the boat didn’t look like the type of boats used in the area. I knew that debris from the tsunami disaster was washing up in the neighborhood and figured that it was likely of Asian origin. What types of creatures or sea life were on the boat? How long do you think it had been there? The hull of the boat was covered in pelagic gooseneck barnacles (Lepas anatifera) , there were also limpets and bivalves attached to the interior. At least one bivalve was later identified to be of non-native origin. How did you respond- what agencies did you call, and what was the process of removing the vessel? How long did it take? My job requires me to work closely with many other state and federal agencies that have interests in and around the HRA’s I patrol. I first contacted the recreation tech with the BLM (Bureau of Land Management) whom I knew to be in the neighborhood. Her job is to ensure compliance of plover closures and other beach rules by recreationalists. Next I contacted the state parks patrol officer who patrols this beach. I knew that everything below the high tide line was the responsibility of state parks and they had a specific interest in possible tsunami debris. Tell me a bit about why you chose to contact an agency rather than leave the vessel there, and why should others perhaps consider doing the same? I did this for several reasons. One, I had been instructed when I came on the job who to contact in the case of different events/occurrences on the beach. Secondly, I have a responsibility to protect nesting snowy plovers and knowing that these types of events could attract crowds and media I knew I needed to act quickly to avoid such an event. 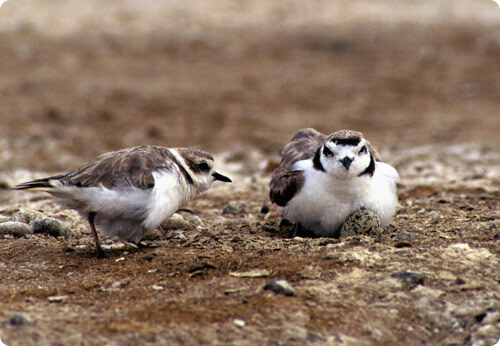 Being a ground nesting bird, snowy plover nests are very vulnerable to disturbance. The areas where they lay eggs need to remain clear of people, cars, pets, ATV’s etc. People, even well-intentioned ones, have capability of easily trampling nests or stressing and flushing birds leaving the nests open to predation. I also knew that the boat likely contained non-native species that could have deleterious effects on our ecosystem and needed to be removed before any organisms had the chance to get established. Lastly, debris from Japan is part of a disaster that caused death and destruction to many people. The artifacts that show up on our beaches need to be treated with respect for the victims of this disaster and lives affected by it. What do you think are important considerations for people who might find debris- in terms of respect for former owners of the objects, or thoughts for wildlife species in the area? When should one consider keeping an item versus reporting it? If a member of the public finds an artifact that appears to be of Japanese origin and that may have value both commercially or culturally they should definitely contact the appropriate authority (State Parks in most cases). This should be done for several reasons. For example, if the object can be returned to the rightful owner than it needs to be. If the object is of cultural importance then it is proper to respect the culture and customs of the country of origin. I think it is important to remember that these artifacts aren’t trophies, but the product of a massive event that caused great human suffering and need to be treated as such. What are your feelings on media involvement or actions that should be taken in circumstances such as this- is it best to get the object out as soon as possible, or is it better to bring social attention to the issue? Although the public has the right to know what is happening on their public beaches, I believe it is really in the best interest of everyone involved to contact the proper authority so they can make an attempt to remove it as soon as possible. Some of these objects can pose a threat to public health or the environment and the proper authorities can quickly identify and start the process of mitigating any threats. Once the appropriate agency is involved then they can determine whether or not to contact the media based on the individual circumstances of the situation. I believe it is the job of the general public to inform themselves on the impact they may have when visiting our natural areas. Working with western snowy plovers I have become very familiar with the negative impacts carelessness can cause on vulnerable resources. It is your responsibility to know which areas are open to the public and which are prohibited, whether or not dogs or horses are allowed, and the negative impacts of negligence. I would really like to thank Jeremiah for his time answering my questions, and for allowing me to share his story and photos on my blog! I believe that his consideration for both cultural respect and biological diversity are something that all beachcombers should emulate when using the beach, or finding possible tsunami debris. Please visit my Resources page to find out who to contact should you find debris. To learn how you can volunteer your time to help the recovery of the western snowy plover, or to learn more about the plover, please visit http://www.westernsnowyplover.org/volunteering.html. Lastly, if you have found debris and would like to share your story or photos with me, please email me at marinecowgirl@gmail.com.